The risk of a home fire rises during cooler weather, but it can be a threat year-round. From space heaters placed too close to flammable materials, to forgotten stove burners left on and unattended, there are a number of potential fire dangers in the average home. The good news is that with increased awareness, plus taking the time to make a fire escape plan and practice it regularly, this destructive and sometimes deadly threat can be minimized. If you do have a fire in your home, Contractor Connection offers the expert services of its nationwide network of fire damage restoration contractors. Each contractor has already been vetted to confirm that he or she has the proper licensing and insurance to work on your home, plus experience in the specialty of fire damage restoration. To receive a free, no-obligation estimate from a pre-qualified contractor in your local area, please enter your ZIP code above. Learn more about staying safe at home with this infographic from the team at Contractor Connection. – Did you Know? Home Fires Can Leave As Little As 2 minutes to escape once a fire alarm sounds. – Create and practice a home fire escape plan. – Keep Chimneys clean and clear of creosote. – Leave three feet of clear space around a space heater. – Clean the dryer’s lint screen before every use. 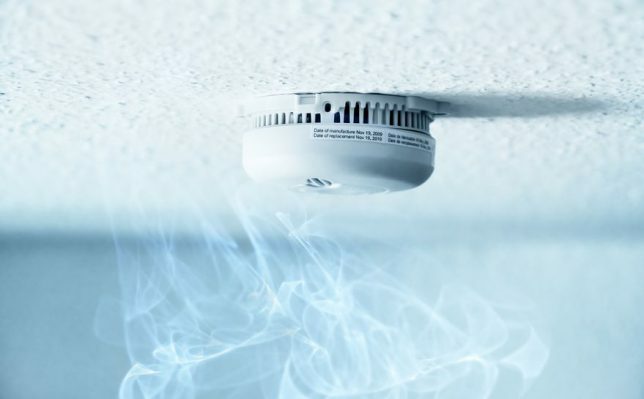 – Test smoke and carbon monoxide detectors every 6 months. – Never leave the kitchen when the range or stove is on. – Prevent smoking fires by never smoking in bed or near medical oxygen as well as when drinking that may cause drowsiness. If you need fire damage services, find a qualified, licensed, and insured contractor to manage restoration work for your home with Contractor Connection.